It is a great pleasure to provide some opening remarks to our workshop From ‘Tablet’ to ‘Tablet’ on digital humanities and Jewish Studies. As is usually the case in such remarks, my intention is to put our endeavors in a broader context and try to sketch out some ideas for future directions, a modest vision or possible agenda if you will, which might guide our discussions and provide some focus. Let me start by providing some historical context to our workshop. The question of how the digital turn is changing the field of Jewish Studies is not a new one. Notably, Heidi Lerner of Stanford University Libraries, has been publishing for years on this intersection. Between 2003-2011 she wrote the Perspectives on Technology column for the AJS Perspectives magazine, and her 2002 article New Technologies and Old Methodologies: Jewish Studies Research in the Digital Age was probably one of the first to address this topic. Moreover, several events addressing the very same question have been organized in recent years. In 2011 the Center for Jewish History organised the workshop From Access to Integration: Digital Technologies and the Study of Jewish History where Anthony Grafton gave a keynote entitled Digitization and its Discontents for Jewish History which was subsequently published online [not available anymore unfortunately]. At the AJS 2013 conference a THATCamp Jewish Studies was organised. The same year, a conference entitled jüdische Geschichte digital (digital Jewish history) took place here at the Institut für die Geschichte der deutschen Juden in Hamburg. This meeting subsequently led to a network jüdische Geschichte digital within the digital history working group of the Historikerverband, the German Association for Historians. Last but not least, both the annual AJS conference and the EAJS conference, held every four years, now feature panels on Jewish Studies and digital humanities. In short, scholarly efforts to understand how the digital turn affects Jewish Studies have been far from uncommon. The Jewish Studies projects highlighted and discussed in these events were manifold and varied and there has been plenty of talk about projects and resources, data and tools in the field of Jewish Studies in the past 15 years. A crucial issue, of course, is the question of what specific characteristics Jewish Studies as a field has, be it in terms of subject matter or sources, and how digital approaches can be harnessed to address these. I have not been able to find more detailed information in the various blog posts devoted to the conference about the answers that were formulated to the specific needs mentioned here, or indeed a specification of what these needs are in the first place. Judging from Twitter though, and as one would expect, some discussion on the distinctiveness of Jewish Studies took place during the talk of librarian Deanna Marcum. According to her, Jewish Studies are indeed to some degree distinctive due their to international scope, long history and multiple languages, but she also stressed that all fields share certain fundamental needs for infrastructure, governance, funding, selection etc. The question of how the characteristics of the field of Jewish Studies play into the ways in which digital approaches and resources can be used was an important concern during the workshop jüdische Geschichte digital, to which our workshop can be considered the international follow-up: is it only about using DH approaches in Jewish Studies? Or are there specific characteristics of a Jewish digital history? Participants in one of the working groups discussing these questions drew attention to the international character of Jewish history, networks and language as some potential specific characteristics of the field. One of the conclusions, which is important for my purposes today, is that that digital projects and resources are very useful given the transnational aspects of Jewish history. In what ways can the field of Jewish Studies benefit from developments in the digital humanities? Formulated less modestly, can we define a set of common characteristics of Jewish Studies and the digital challenges they pose for the field? Before proceeding, it might be good to ask at this point: what do we mean when we talk about “Digital Humanities” and “Jewish Studies”? And what about the intersection between the two? How do we conceptualize that intersection, if we believe such an effort is necessary? Both “Digital Humanities” and “Jewish Studies” are umbrella terms, yet of a different nature. It is less clear though what we mean when we talk about “digital humanities”. It does not separate digital history (or any other humanities sub-discipline) from digital humanities but acknowledges common methodological challenges and epistemological changes. This, of course, is not to suggest that the various humanities disciplines do not engage with distinct questions and specific methodological problems of their own too. If Schnapp and Presner still chose to talk about DH, others have questioned the usefulness of the term altogether. Note that Underwood is a literary scholar and he rightly observes that his own digital practice and projects might have very little, if anything, in common with those of, say, an art historian. Yet, this particular take on DH is perhaps somewhat too simplistic. The digital humanities do share a certain methodological commons or scholarly primitives, to name the two well-known phrases coined by Willard McCarty and John Unsworth. on the other hand, we should realize the specifics of these disciplines and be ware that there is often little common ground given the huge variation of digital approaches practiced in them. In this respect, Jewish Studies is no exception: basic common characteristics and (sub)disciplinary specifics also need to be recognized when considering the intersection of DH and Jewish Studies: a scholar of Jewish literature might see him-/herself as part of Jewish Studies yet has much more in common with his/her peers in the field of literary studies then with historians of Jewish migration who, in a similar vein, might feel more intellectual kinship with their fellow migration historians. Focusing on, and further fleshing out, those characteristics of Jewish Studies that are broadly shared by all of the subdisciplines it incorporates, then, seems to be the best way forward: it allows us, in the end, to arrive at the specific digital challenges we face. These common characteristics relate to certain specific aspects of Jewish history and culture such as its textual tradition, migration (of people, texts, ideas etc); transnational aspects. These are reflected in both the state of Jewish heritage (dispersal of sources) and its nature (textual, multilingual).They also result in specific research questions (migration in all its forms, transnational aspects and intertextuality) that should be addressed. All of this, in turn, yields specific technological challenges and possible digital approaches. Think about linking & aggregating resources when it comes to the state of Jewish heritage; think about, for example, translation & OCR, Named Entity Recognition, multilingual search when its nature is concerned; and think about, for instance, network analysis methods when research is concerned. When dealing with the former, i.e.dispersal, linking and aggregating resources scattered in different places is crucial. Concerning the nature of Jewish heritage we can think of the importance of translation & OCR and challenged in Named Entity Recognition and multilingual search. Let me provide a concrete example of the latter: the wonderful Historical Jewish Press website contains newspapers in English, French, German, Hebrew, Hungarian, Judaeo-Spanish, Judeo-Arabic, Polish, Russian and Yiddish, meaning we are dealing with four alphabets. It is currently possible to search the website in multiple alphabets provided that the words are entered in the relevant scripts. A search for “דרייפוס <OR> dreyfus“ will thus yield results in English, French, German etc. as well as Yiddish newspapers. This is pretty amazing. Imagine if only entering the word ”Dreyfus” would yield results from newspapers in all four alphabets currently in the database! Imagine if the books in the Digital Yiddish Library and the materials in the YIVO Vilna Collections Project were fully searchable by content, not only printed text but also handwriting. Imagine, too, that the non-textual objects, such as images, contained within them would be metadated and marked up using XML. Imagine these resources would also be linked to the information in the EHRI and Yerusha databases, bringing in archival descriptions and their metadata. Then imagine a search engine that could simultaneously search all these materials. It would mean linking and aggregating the data and metadata of all resources mentioned. It would mean developing, or refining, advanced multilingual OCR technologies, linking ontologies, vocabularies, and developing a multilingual Named Entity Recognition system. What would the outcome be? It could mean that a scholar looking for information on the Dreyfus affair would find newspaper articles in multiple languages, references in books, pointers to important archival collections etc, all through a single interface. Working towards solutions for information retrieval from dispersed, multilingual sources is the key challenge for Jewish Studies. This is also where the question of how to label our endeavours comes in. Does it make sense, in light of the above, to speak about Jewish Digital Humanities. I would suggest not. Every (sub-)discipline has its own characteristics, preferred methodologies, specific research questions, etc. for which certain digital methodologies might be particularly suitable, and I have just outlined some basic ones in the field of Jewish Studies. Yet for all of us it is equally important to engage with, learn from, and share experiences with colleagues in the humanities in general. We should not be building another silo but adopt a two-track approach. For someone studying Judaism and social media, engaging with current work on the intersection of DH & religion outside Jewish Studies is as important as talking to ones direct colleagues. My talk has so far focused on some potential challenges for the coming two days. In the remaining part of my talk, I would like to briefly mention some other thoughts. and academic researchers who want to use these texts/sources for their specific research purposes. The interests of these audiences do not necessarily overlap: non-academics might be perfectly happy with having access to digital sources whereas academics might want to be able to get their hands on the underlying datasets as well so as to perform more sophisticated analyses. The question, however, is not only about the level of access provided to what has been digitised. and the research value of certain collections. We should therefore consider the politics of digitisation, not only to ask what implications it has for research, but also for the (his)tories we tell. From a preservation and access point of view, digitising an institution’s most used materials might be a perfectly sound criterion, but from a scholar’s point of view it can be problematic because it has an inherent danger of simply reproducing well-known narratives about the past instead of allowing for the interrogation of new sources that might question these. This is related to what is often described these days as “hidden” archives; those archives and/or their catalogues that are not accessible online. I will leave aside the problems inherent in using the phrase ‘hidden’ here. If we recognize that many archives will not be digitized in the foreseeable future, if ever, there is a clear challenge: online cataloguing and linking of archival descriptions is as important as digitisation. Projects like EHRI and Yerusha are fulfilling crucial functions in this respect. For a comprehensive account of a given historical topic it is imperative to make use (or at least be aware) of the full range of materials available to study that topic, whether these can be found online or offline. There is a dangerous paradox here: while we are still very much in a phase where digital skills need to become part and parcel of historical curricula and the historian’s mind- and skill set, the phrase ‘hidden materials’ suggests that a phase will come where we actually need to educate students about the existence of non-digital resources lest they be forgotten (there are some signs that this phase is already upon us and students are increasingly turning to online resources). there are researchers explaining how they worked with these resources. For many practitioners it’s important to discuss challenges in building digital resources, technical aspects about for instance data linking, sharing practical experiences etc. For many academics there are critical questions to ask about such digital resources which, after all, could form the starting point for their research. The crucial question for them is how all these data/tools change, or can change, academic knowledge production. It seems to me, then, that the big challenge and imperative is to put practitioners and researchers into productive conversation and to integrate practical aspects and critical reflection when dealing with digital resources. This is related to the issue of uptake of digital resources/methods among academics and the well-known “if we built it, will they come” question. It also has to do with the broader issue of involving users in the creation of digital resources, from questions of database construction to data curation to interface design (in order to create an awareness of context, for example). Many projects (EHRI is a very good example) already address these issues, yet many historians are unaware and skeptical (for reasons other have addressed previously) about the potential of “going digital”, not least because there is a myth that it’s just about scale and technology, and not about new methodologies and thus the quality of research. Thank you for your attention and I wish all of us a very succesful and fruitful two days! 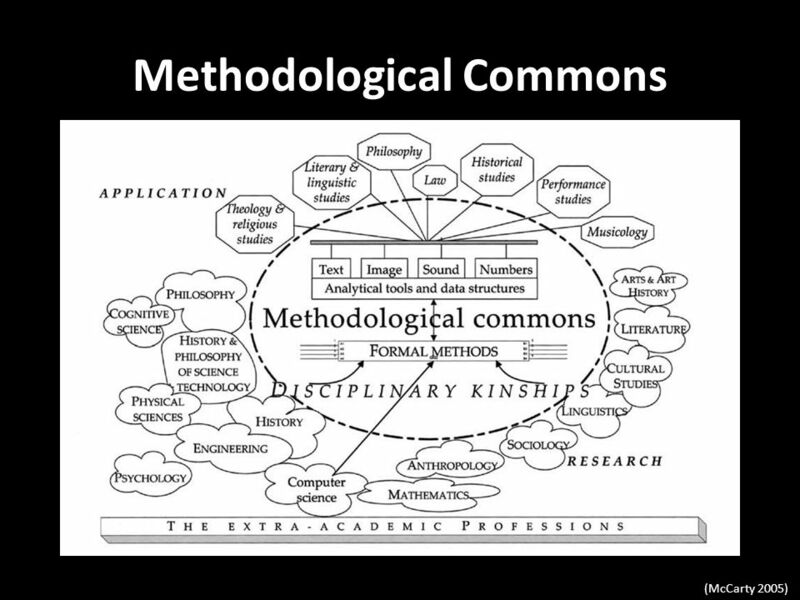 The two classic takes on commonalities are Willard McCarty’s methodological commons and John Unsworth’s scholarly primitives. See: Willard McCarty, Humanities Computing (Basingstoke 2005) 114-158; John Unsworth, ‘Scholarly Primitives: What Methods do Humanities Researchers have in Common, and how might our Tools re ect this?’, Symposium Humanities Computing: Formal Methods, Experimental Practice (King’s College London, 13 May 2000). ‘The Digital in the Humanities: An Interview with Ted Underwood’, Los Angeles Review of Books, 20 August 2016. Note that for McCarty this phrase was a description of an unsatisfactory state of affairs in humanities computing. His aim was to “construct […] a wall around some intellectual turf in order to form itself into yet another discipline like the rest”. With regard to the Jewish textual tradition it is important to note this should not to be reduced to religion. Think, for instance, about the importance of books, newspapers, translation and Jewish self-learning in Eastern Europe.